A large lounge/dining room with oak dining table and chairs, sofas, coffee table and a stereo CD system. A generous kitchen with fridge, washing machine, gas cooker, microwave as well as table and chairs. Two double bedrooms, a single bedroom and a fourth bedroom with two single beds. A baby cot is available, if required. Sufficient clean bedding is always available in the form of duvets, pillows and blankets. A shower-room with WC and basin is situated downstairs and a second WC and basin is located upstairs. The house is fitted with UK and French style electricity outlets. Le Caperdu includes a large garden and an extensive orchard where children can safely play. The kitchen opens on to a secluded south facing garden with patio and a barbecue. Local shops include a supermarket, bakery and butcher, all within two kilometres. Organic produce from the garden and fresh eggs are available depending on the season. St. Lô, with its famous Saturday market and an extensive range of shops and restaurants, is about fifteen minutes drive away. Bayeux and Carentan, both popular tourist destinations, are about 20 minutes by car. The Normandy D-Day landing beaches, St. Mere Eglise, and many other World War 2 monuments are all within easy reach. The ferry ports at Cherbourg and Caen are within 1 hours drive. For those who enjoy nature, Caperdu has six hectares of recently planted small trees which will eventually grow into the Caperdu Forest, and visitors are always welcome. 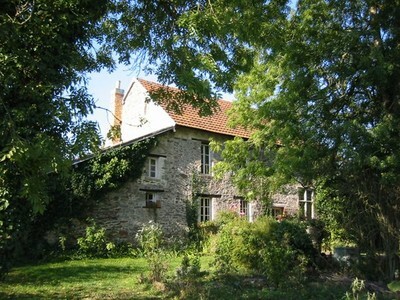 The house is within the Cotentin wildlife park where nesting storks are an annual attraction. Le Caperdu is close to Lison station on the main Paris to Cherbourg railway. It takes about two hours by train to reach Paris.